Rand McNally | Coolest Small Towns to Visit in the U.S.
Blog Home Coolest Small Towns to Visit in the U.S. Located 90 miles southeast of Tucson, nestled in the heart of the Mule Mountains, Bisbee, Arizona is the perfect mix of history, culture, and delightful weather. What is now an artist’s paradise was once a booming mining town. Founded in 1880, Bisbee produced three million ounces of gold and more than eight billion pounds of copper, and became one of the most cultural cities in the American West. 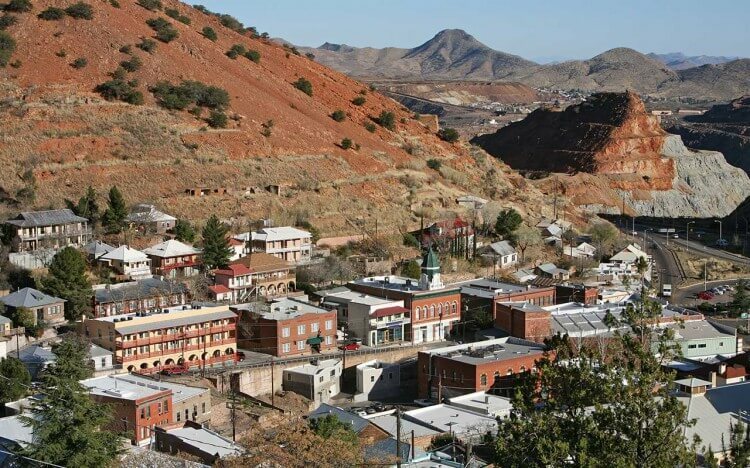 In the early 1900’s, Bisbee became the largest city between San Francisco and St. Louis, but when the mine closed in the 1970’s many left to seek employment elsewhere. Though the population has diminished, this quirky little town now beckons bohemian-types with its small-town charm and beautiful mountain views. Eccentric Victorian-style buildings have been repurposed into a myriad of galleries, boutiques, restaurants, bars, and bed and breakfasts. Check out Belleza Fine Art Gallery for an upscale collection of art, whose proceeds help support Women's Transition Project of Bisbee. Don your hard hat and miner’s headlamp and take a dive into history on the Queen Mine Tour. Go 1,500 feet into the mine while educated guides recount techniques, danger, and drama experienced within its depths. A picture-perfect town nestled below the peaks of the northern Rocky Mountains, Whitefish has something for everyone. For skiers and snowboarders, there’s Whitefish Mountain Resort known for its spectacular views of Glacier National Park and Flathead National Forest. Boaters can hit Whitefish Lake right in town or venture a little farther south to Flathead, one of the largest natural freshwater lakes west of the Mississippi River. Hikers and bikers will find no shortage of trails, and anglers can cast their lines into a number of world-class trout streams. Vibrant and historic downtown Whitefish has plenty of urban-style allures behind its storefronts. And if you’re looking for a party, the Whitefish Winter Carnival is an annual February celebration of all things cold and snowy. The event features skijoring races, in which horse-drawn skiers compete on a course of gates, jumps, and other obstacles and challenges to win both cash and bragging rights. The main drag of Carmel is filled with quaint bakeries, shops, restaurants, and galleries just waiting to be explored. Get your caffeine fix at Carmel Coffee House which offers fresh small batch roasted on premise coffee in a small picturesque European-style café. Spend your afternoon soaking up some sun on the white sands of Carmel Beach where you can enjoy watching dogs splash in the surf, dolphins popping their noses out, and the relaxing sound of crashing waves. It also has a sunset that can’t be beat and attracts both locals and visitors alike! Sitka has 22 sites on the National Historic Register including St. Michael’s Cathedral, which was the first Russian Orthodox Church in North America, and was the largest structure in Alaska at the time of construction in 1848. Adventure lovers will appreciate the clean air and stunning vistas that dominate the island. Immerse yourself in nature by touring ancient volcanoes, kayaking the frigid waters, hiking the ridgelines, and sharing the space with abundant wildlife such as brown bears, bald eagles, harbor seals, and humpback whales. A quintessential mid-coastal Maine town, Rockland offers up a quiet slice-of-life and a whole lot of lobster. This charming little fishing community has a deep protected harbor and is one of the biggest shipping ports of lobster in the world. If this luxury dish isn’t enough to convince you to visit, the historic houses, vibrant art scene, and friendly people just might. For the biggest crustacean celebration, you’ll want to come for the Maine Lobster Festival, which draws in tens of thousands of visitors for a taste of the best seafood that the state has to offer. There’s also the famous Farnsworth Art Museum, which has more than 10,000 pieces in its collection and is highly regarded in the art scene. If you are more of an outdoors fan, Rockland offers an array of activities like canoeing, biking, golfing, or relaxing on one if its pristine beaches. Port Townsend, Washington is a charming Victorian sea town on the tip of the Olympic Peninsula with a fascinating history. It was originally planned to become the “New York of the West” and underwent a building frenzy in the late 1800’s, only to have the railroad be redirected up to Seattle instead. While Port Townsend never became a commercial hub, beautiful architecture still stands as a testament to a bygone age and many of the buildings have been converted into elegant bed and breakfasts, galleries, and shops. Pop into Cellar Door after 5 PM for craft cocktails with house-made infusions and live entertainment 7 nights a week. Surrounded almost entirely by water, the town is a boater’s haven. Many firms here specialize in crafting beautiful wooden boats and the town is home to the renowned Wooden Boat Festival — the first and largest of its kind in North America. Also enjoy kayaking, rowing, sailing, and awesome whale watching experiences. With a year-round population of less than eight thousand, the quiet town of Sanibel Island, Florida draws in vacationers looking for some relaxation with its beautiful sunsets and luxurious resorts. While most islands have a north-south orientation, this unique barrier island is east-west — giving it long stretches of sand and shells, and has been named one of the best shelling beaches in Florida. Sanibel Island offers its visitors kayaking, golfing, shelling, fishing, boat tours, and more. While you’re there, pay a visit to the Sanibel Island Lighthouse. Constructed in 1884, the lighthouse and its keeper building are the oldest structures on the island. Dahlonega was the site of the United States’ first major gold rush and is nestled in the heart of Georgia’s wine country. This mountain getaway, just an hour north of Atlanta, offers a host of galleries and museums, beautiful vistas, roaring waterfalls, wineries, and more. Known as the Heart of Georgia Wine Country and the Wine Tasting Room Capital of Georgia, there are plenty of places to check out. We recommend Frogtown Cellars, which has won more awards than any other Georgia winery in major U.S. competitions. It has over 22,000 grape vines on 42 acres — both of the red and white variety. Located on top of the largest gold deposits east of the Mississippi River, Dahlonega has a long history with this precious metal. Tour the winding mine tunnels, learn about the history, and even try your hand at gold panning. The Consolidated Gold Mines and gold processing mill was built in the early 1900s and still conducts tours to this day. Travel 200 feet underground on tours that are conducted daily.